So you’ve probably seen, heard of or even had a henna tattoo. Henna tattoos are popular at beaches, boardwalks, street fairs, festivals and of course, for those who use henna culturally, at wedding ceremonies and other cultural and religious events. However, there is now, a somewhat new product, Jagua. It has many similarities to henna. Jagua is still pretty unknown to most people, so here is a list of the similarities and differences henna and jagua share. Both henna and jagua last about 1-2 weeks on the skin depending on where it’s applied on the body. They both stain the skin and get removed by the exfoliation of the skin. So, it’s the skin that determines how long it lasts. Both are an all natural plant based product. Dry time is about 30min-1hr depending on the thickness of the design and the temperature. It’ll dry slower in cold weather and faster in warm. Both take several days to develop to it’s darkest color. You should not get into hot tubs or chlorinated water during the first few days or it may not get as dark as it should. It needs this time to develop. Henna is a brown/red color and Jagua is a black/blue color. 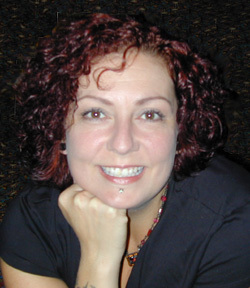 Since both are natural products, the color range may vary a bit from person to person and crop to crop. Henna is perfect if you want a natural, temporary look and Jagua looks like a permanent tattoo. Some people like henna because it’s definitely not permanent looking and others want as close to a permanent tattoo as they can get. 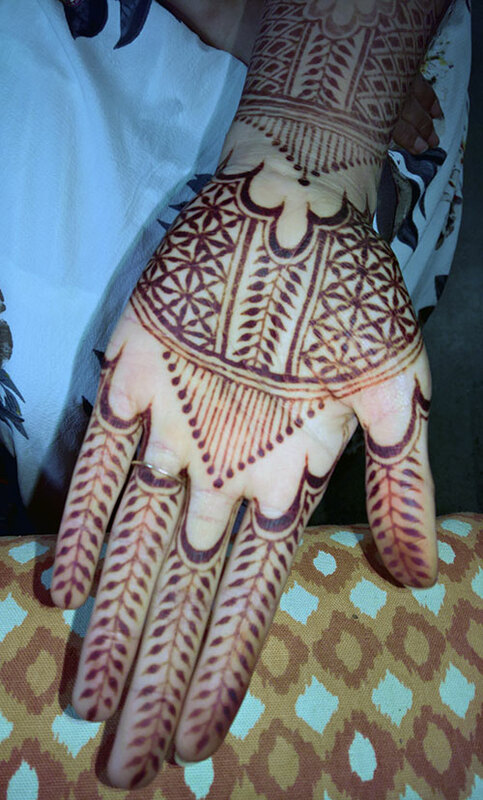 Henna needs to be left on the skin longer about 4-6 hours to stain the skin well. 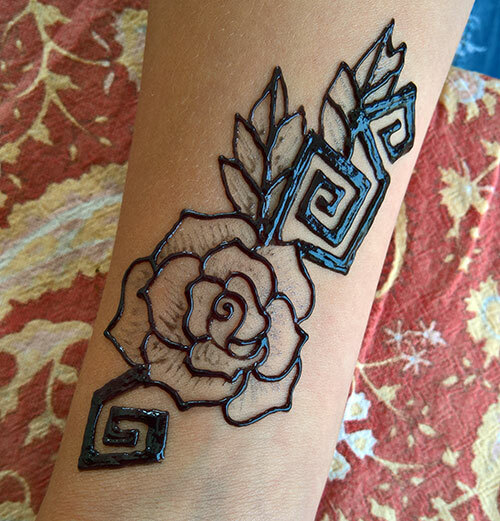 Jagua is removed between 2-3 hours so it gets air and can oxidize to it’s darker color. You can’t get your new henna wet for the first 12 hours but Jagua can get wet after 3-4 hours. This means you can wash it with water but both henna and jagua still need to be free of chemically treated water for 2 days.